Your car is a big investment in your life so it is only natural for you to want to protect your investment at all costs. 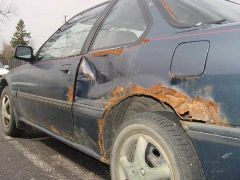 One of the biggest things you will want to protect your vehicle from is rusting. Therefore, it is important to understand why a car can rust and how to help keep it from rusting faster, especially when you live seaside. What causes a car to rust? Rust is the corrosion of metals that occurs under certain conditions. Typically, rust, or oxidation of metal, occurs when the metal is exposed to iron, oxygen, or water. The chemical reaction between the metal and the iron, oxygen or water breaks down, or oxidizes, the metal causing the appearance of rust. The most common cause of rust on cars is exposing the metal to water. Though most newer cars are coated with steel in order to try and prevent rusting, or at least slow down the process of rusting, over time, or in situations where the amount of exposure is higher than average, rust still occurs, even on new cars. Therefore, it is important to be aware of conditions that encourage the rusting process and understand why rust occurs in the first place. Then you may be able to help slow down or prevent rusting from beginning on your vehicle. Why a car rusts faster in seaside locations? Many people ask why cars rust faster when in seaside locations. Even though we know that water can trigger rusting, car owners that live near the ocean typically find that their cars are prone to rust much earlier than cars that are located in places that are not seaside. However, it is not just the water that triggers the rusting in these seaside locations, it is the combination of the moisture in the air (water) and salt in the air from the ocean water. Water and salt can each lead to rusting on their own. Therefore, it is not a surprise that the combination of water and salt in the seaside air can lead to a car rusting faster. What you can do to protect your car if you live seaside? Unfortunately there is not a lot that a vehicle owner can do to prevent the rusting process while living seaside, though you may be able to slow down the process. Most new cars have a coating that is already intended to be a preventative. However, some other things that vehicle owners can do to help slow down the rusting process include more frequent washing, professional rust-proofing, waxing your car regularly, and seal scratches and dents immediately. It is recommended that you wash and wax your car at least every two weeks when you live in a high moisture or seaside location to help keep the salt and moisture mixture from starting the rusting process. In addition, taking your car to a professional to have a rustproofing sealant put on your car can be helpful. A professional rustproofing agent is applied to all parts - some parts are even removed to ensure they are completely coated. You will also want to make sure that you seal scratches and dents you find on your car as soon as they are noticed. You can do this by applying clear nail polish to the scratches and dents immediately. Your car may be one of your biggest investments. Doing what you can to protect it from rusting prematurely is important. Preventing, or slowing down, the rusting process starts with understanding what causes rust and recognizing how your vehicle may be at risk for rusting. Once you understand the factors that are located in your geographic area, you may be able to take precautions to limit or stop the beginning of the rusting process on your vehicle.